For those who’ve already heard about the film, and just want to buy their tickets without hearing me go on and on about how important it is that they see it, all the event details are on the poster below. As a *pretty please* from the organizers, I ask that you click here to buy your tickets in advance, and also that you click “join” on the Facebook event page to let all your FB friends know you’re going (’cause then they’ll want to go too, of course!). 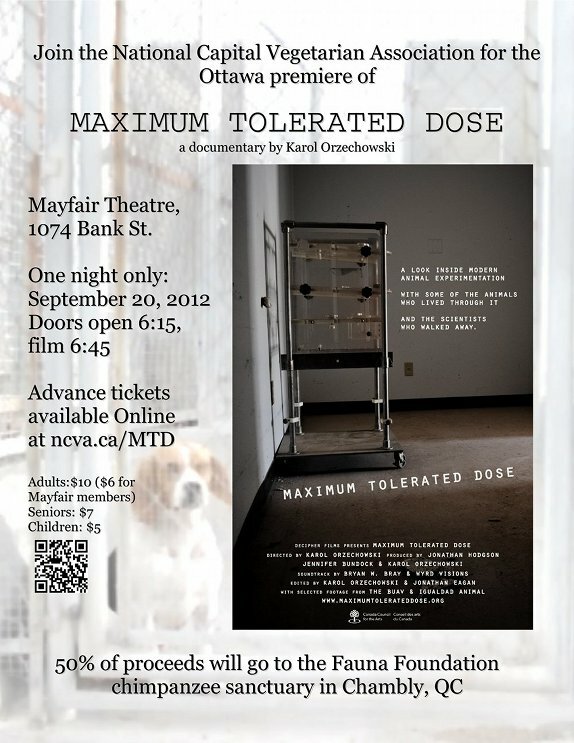 For those who haven’t yet heard of the film and want to know more, tune in tomorrow to listen to me…well, go on and on about how important it is that you see it…Or just check out the film’s website, as well as that of Quebec’s Fauna Foundation Chimpanzee Sanctuary, to which Decipher Films and the NCVA will be donating 50% of the evening’s proceeds. Click on the image to view a larger version!